"Fortia fortiorum facta sunt" ("Da gent coragiosa a ven-o dij fàit coragios"). Dòp avèj sotsignà ël Pat Nassional ant ël fërvé 1638, a l'ha avù leugh ant la catedral ëd Glasgow, dòp 36 agn, la prima Ciambréa General dla Cesa 'd Scòssia con Alexander Henderson coma moderator. La Ciambréa a l'ha prinsipià na completa arformassion dla cesa. A l'ha diciarà "papista" i SinchArticol ëd Perth, ël liber dij Canoni, ël Liber dle Orassion comunitarie e nen legal l'istès sistema vëscovil. 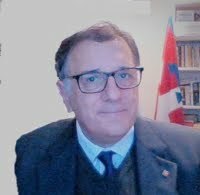 Ël rapresentant dël Re, ël marchèis ëd Hamilton a riva e a diciara nen legal la Ciambréa, përchè 'l Re a l'avìa nen dàit ël permess ëd radunela. Henderson a rëspònd: "A nòm dël Signor Gesù Crist, l'ùnich Cap e Sovran ëd costa Cesa, i podoma nen alvé la ciambréa". Hamilton a l'é andassne an lerma! "Fortia fortiorum facta sunt." ("From brave men come brave deeds"). After the National Covenant was signed in February 1638, the first free General Assembly of the Church of Scotland for 36 years was held in Glasgow Cathedral in November with Alexander Henderson as moderator. The Assembly began a complete reformation of the church. It declared the “popish” Five Articles of Perth, the Book of Canons, the Book of Common Prayer and Episcopalianism itself unlawful. The King’s representative the Marquis of Hamilton arrives and declares the Assembly unlawful because the King never gave it permission to sit. Henderson responds “In the name of the Lord Jesus Christ, the only Head and Monarch of this Church we cannot dissolve this Assembly” Hamilton left in tears!